Dr. Mary Lynn Lackie has had a love for anything to do with animals from a very young age. Being raised on a mixed family farm in Eastern Ontario provided plenty of opportunity to care for animals and solidified her desire to become a veterinarian. Every occasion to work with and learn about veterinary medicine was taken during these early years and therefore it was a natural progression to graduate from the Ontario Veterinary College in Guelph in 1996. Dr. Mary Lynn returned to Eastern Ontario and for the first 5 years of her career, practiced small animal emergency medicine and mixed animal practice. She also took the opportunity to work in both England and Wales before settling into her long term position at Village Veterinary Clinic in Russell, in 2001. During her time as an associate veterinarian, she has completed over a dozen diagnostic ultrasound courses. This has allowed her to develop a special interest in abdominal ultrasound techniques and diagnostic fine needle aspiration. She continues to perform routine and non-routine soft tissue surgery on a regular basis. She has successfully completed several canine and feline dentistry continuing education courses, remaining up to date on important dental health and surgery. 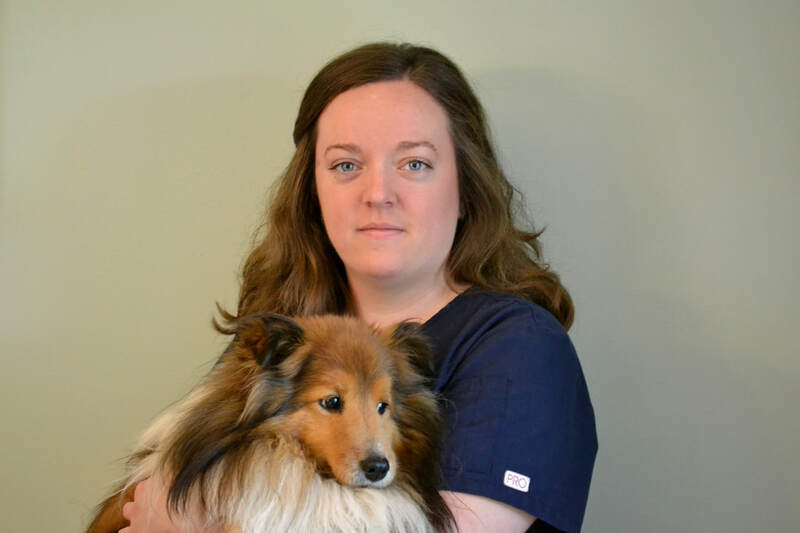 Her latest endeavor is assuming ownership of the Village Veterinary Clinic and aspires to continue to provide veterinary care that exceeds expectations for her clients. What keeps her love for veterinary medicine alive after all these years, is developing relationships with clients and their furry companions. When not at Village Veterinary Clinic, you can find her enjoying time with her family, at their cottage or on their farm. She resides in Russell with her husband, Brian, their 2 daughters, Amelie and Paige, their Golden Retriever, Maddie and their two cats, Gem and Sassy. Mary Lynn enjoys volunteering as a trainer on her daughter's hockey team, travelling, long distance running and taking crossfit classes. 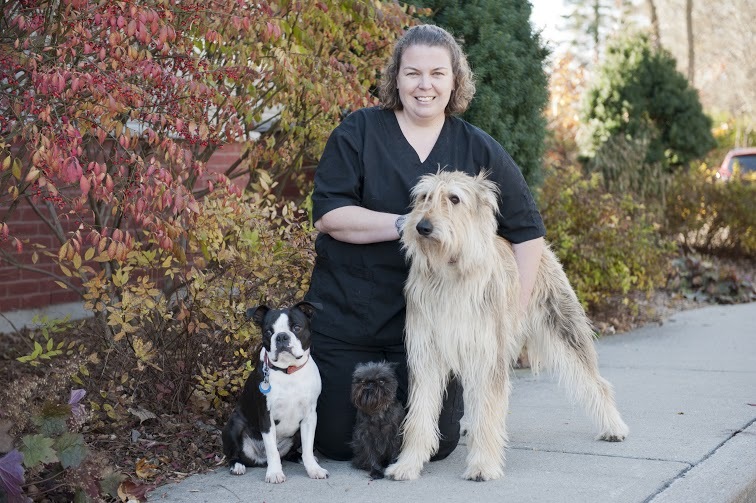 Elizabeth started working at the Village Veterinary Clinic in 2005 after graduation from the Ontario Veterinary College. She also holds an MSc in environmental studies from Dalhousie University and a BSc in wildlife biology from Trent. Elizabeth has lived and worked in many parts of the world, including the UK and Australia, and has volunteered her veterinary skills in Kenya, Uganda and South Africa, working along side the WSPCA and the Wildlife Veterinarians in Nairobi National Park. She continues to enjoy travelling and loves the outdoors, using her spare time to kayak, ski, hike and observe wildlife. Her passion for medicine is second only to her love of animals. She keeps current with the latest medical treatments by attending yearly veterinary conferences and studying through continuing education courses. She fights whole-heartedly for the ethical treatment of animals and to preserve and strengthen the human-animal bond. At home she is terrorized and loved by her two playful, mischievous cats Poppy and Kazio. Haley began working at the VVC in April, 2018. She is a graduate of the Ontario Veterinary College and holds an honours degree in BioMedical Sciences from the University of Guelph. Before VVC, Haley worked in small animal practices in Gananoque and Brockville, Ontario. She is thrilled to be a part of this amazing team, and looks forward to meeting and providing special care for each client and pet of VVC! Before graduating, Haley spent her time working on a dairy farm and horse-back riding in her home town of Uxbridge, Ontario. She also gained experience in small animal medicine with her Aunt and Uncle, who were both vets. Haley knew from a young age that a career in medicine was her passion, and her love of animals naturally led her towards Veterinary Medicine. Her special interests include dental surgery and aging considerations & care for geriatric pets. Haley loves cycling, cooking, travel and her family. She is living with her partner, Kevin, who is a mixed animal vet, and their adopted Cat, Eddie, who loves cuddling, car rides, and eating. Julie is a St. Lawrence College grad who has been fortunate enough to work in many aspects of the veterinary field. She has been working at VVC since 2004. Julie lives with her partner and a menagerie of pets. Becky grew up on a small family farm outside of Chesterville. She has been surrounded by animals her entire life. 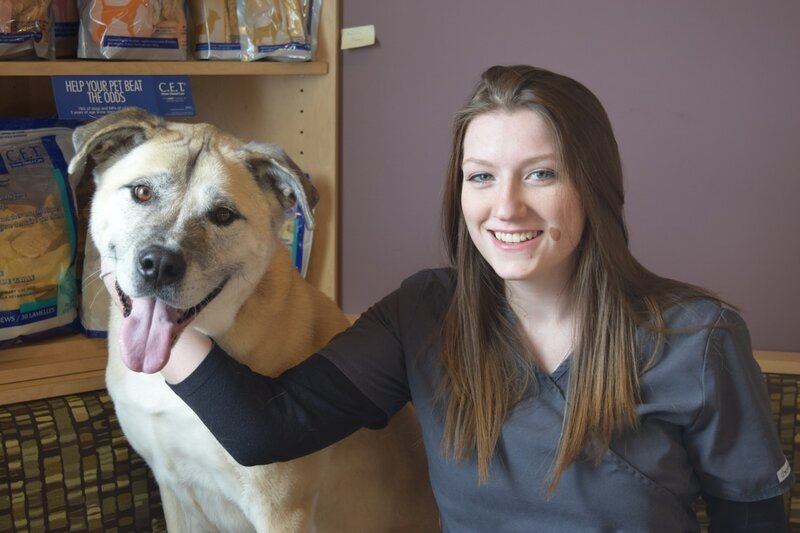 Once her high school placement was completed here at Village Veterinary Clinic, she headed off to St. Lawrence College and graduated from the Veterinary Technician program. After a few years of experience elsewhere, she has returned to us. Becky loves to go for walks, camping and spending time with family. She calls Bourget her home with her partner and Shepherd mix companion Missy. Missy loves to run around in the backyard and her all-time favorite game is fetch! Chances are if you adopted a cat from our clinic, it first spent some time in Lisa's home. She is often the one who will rehabilitate stray cats that are brought in. Lisa has worked in all areas of the clinic since the day it opened in September of 1992. Her favorite role is at the front desk greeting clients and their pets. She commutes from Kemptville where she lives with her husband, three teenage daughters, two cats (occasionally more) and an outnumbered dog. Briana graduated from the Veterinary Assistant program at Algonquin College in February 2018. She completed her field placement at the clinic and has been working here since then. When not working, she enjoys reading, painting, and photography. All of her pets are rescue animals. ​One of the first people you are likely to meet or speak with at the clinic is our receptionist, Katie. She is also our website designer. Her outgoing personality brings wonderful enthusiasm to the workplace. A lifelong animal lover, Katie especially enjoys her time with her Chocolate Labrador Schnauzer Mix, Winnie. Her interest in post-secondary education has led to a degree from Carleton University in Criminology with a concentration in Sociology. In her spare time, Katie also enjoys photography, playing defense in ball hockey and spending time with friends and family. Fully bilingual Russell native Elise Bankley has always had a passion for working with animals. Since March 2015, she has managed her full-time studies with her part-time work with the clinic. As a loving dog and cat owner, she knows first hand how pets are a big part of a family. Elise is looking forward to building a professional future in animal care. Amelie has had a love for animals and an interest in veterinary medicine for her entire life, inspired by her mother. She was raised on a dairy farm outside of Russell and has grown a passion for all sorts of animals. When she is not at school or the clinic, she enjoys playing multiple sports as well as traveling. Amelie has worked part-time at the clinic since 2017 and hopes to build a career in veterinary medicine in the future. Evie has been a part of our team since 2007. She enjoys sleeping on all shapes and sizes of pillows, treats, being brushed, taking sun baths, and she loves dogs. Stop by the clinic sometime to meet our clinic cat! Tedford came to us in the winter of 2018. He enjoys TV, snuggles and meeting new clients. He especially loves large breed dogs. Follow him on Instagram @ted_ventures!